garden centers, flower shops, churches, schools, and direct to the public as well. We do not ship any plants outside our local area. New this year! Succulents can be found here! Downy Mildew disease that has destroyed Impatiens in the garden the last 3 years or so! Open our Spring Price List here (pdf). What's happening now at Rice Greenhouses? Spring flowers are mostly ready and are selling now. We still recommend waiting to actually plant them though, as May 10-15 is considered the frost free date for our area. 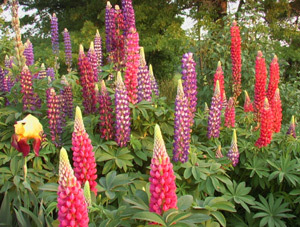 The best selection of Perennials is usually in April. The best selection of Hanging Baskets is usually mid to late April. 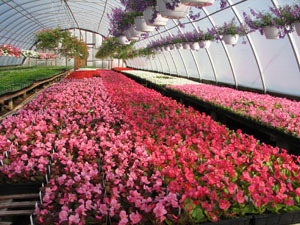 The best selection of Geraniums and New Guinea Impatiens is late April. The best selection of Bedding Plants in flats is late April through the second week of May, although we usually have some selection until late May. Remember that the Frost-Free Date for our area is @May 10-15, although on rare occasions it can occur later. Don't rush to plant too much before then as the ground will be too cold for optimum growth anyway. 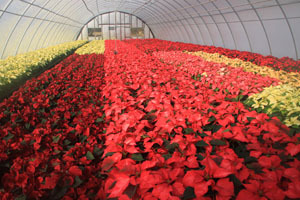 Place your Christmas Poinsettia orders in September or October for best selection of sizes and colors.